Distinctive dark head-stripe from nostril to behind the eye, as is the white stripe below the eye. Variation in dorsal (back) markings also present. Bright orange colour in groin and inner thigh; more vibrant in males. Uniform green male calling. Smooth skin. Note the head stripe beginning at nostril and past the eyes. Slender smooth body, white belly, dark lateral stripe extending from nostril to the shoulder, bright orange colour on thighs and legs when extended. Elongate body, well-developed toe-pads and finger discs and either a green or beige coloured body, sometimes with dark flecks or spots. A dark lateral stripe extends back from the nostril, usually to the shoulder. A white stripe above the lip also extends from the eye to shoulder. It has a smooth back, and a granular white belly. A bright orange colour is visible behind the thighs when legs are extended, particularly vibrant on the males. Described as a high-pitched, drawn-out 'reek' followed by a staccato 'kik-kik'. Calls on warm nights, often following rain during spring, summer and autumn. Also may call during the day in hot sun some distance from water. 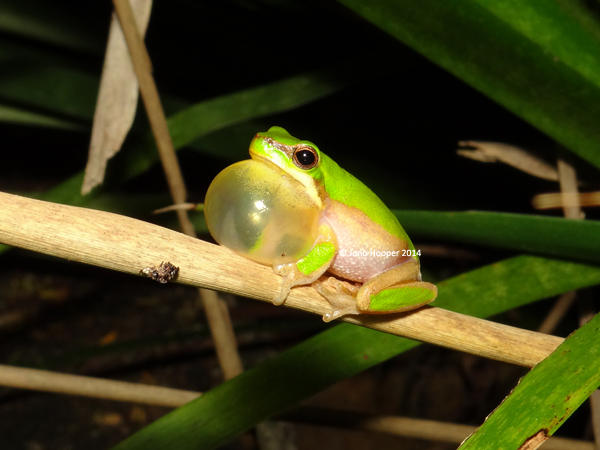 When several eastern sedgefrogs call together it can become deafening to the human ear. 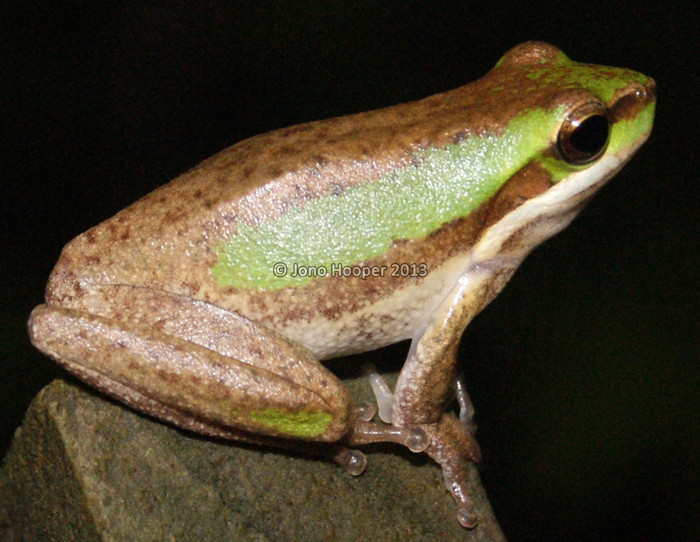 This frog will breed in short and long-lived water bodies in open forest and disturbed, urban areas. 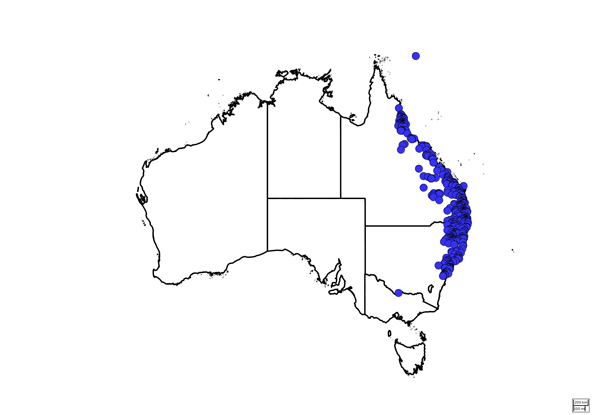 Widespread distribution. 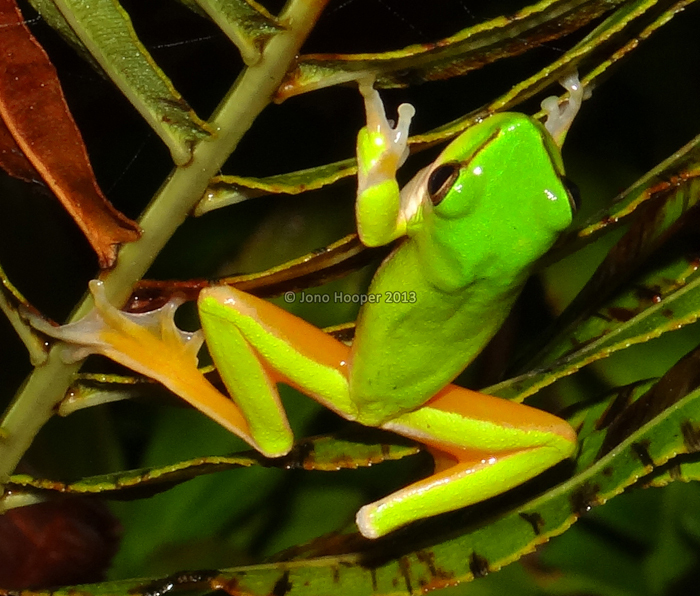 Often mistaken for the Green treefrog (Litoria caerulea), but the former is a much narrower and smaller frog. 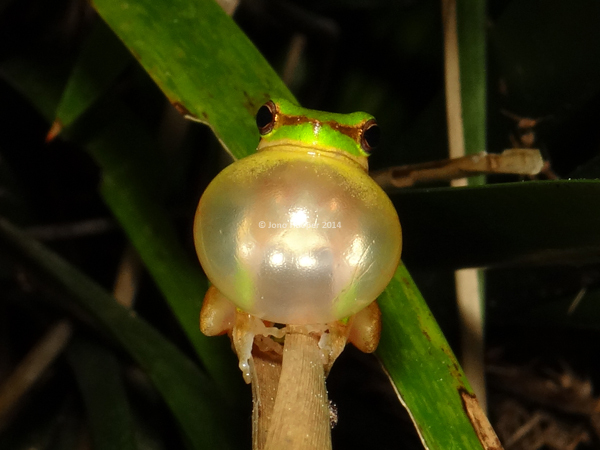 Related to the Wallum Sedgefrog (Litoria olongburensis) and the Cooloola Sedgefrog (Litoria cooloolensis). Species description paraphrased by permission © Ed Meyer. Text must not be used without the author's permission.